Rob McEwen Chairman and Chief Owner, McEwen Mining Inc. Rob McEwen is the Chairman and Chief Owner of McEwen Mining Inc. 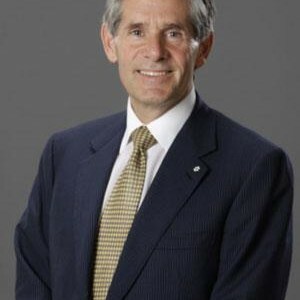 He is the founder and former Chairman and CEO of GoldCorp Inc., which is, by market capitalization, the largest gold producer in the world. In 1990, Rob jumped from the investment industry into the mining industry. By 1993, he had begun a consolidation of five companies that would take eight years to complete. The resultant company was Goldcorp Inc. which has become a gold mining powerhouse. During the last thirteen years of Rob being CEO, the company’s market capitalization grew from $50 million to over $8 billion and its share price grew at a compound annual rate of 31%. Rob and his wife, Cheryl, have donated in excess of $50 million to encourage excellence and innovation in healthcare and education. Their donations have led to the establishment of the McEwen Centre for Regenerative Medicine at Toronto General Hospital and of the McEwen Leadership Program at St. Andrew’s College. In addition, significant donations were made to the Schulich School of Business, the Margaret Cochenour Memorial Hospital, Lakefield College and Red Lake Regional Heritage Centre to further their efforts to be the best in their respective fields. Rob is a passionate innovator, marketer and an avid recreational competitor. He is also a member of the Dean’s Advisory Board, Schulich School of Business; X Prize Foundation: Vision Circle and Board of Trustees; International Society of Stem Cell Research (ISSCR); Global Advisory Counsel; and CEO (Chief Executive Organization) and WPO (World Presidents’ Organization). Rob was awarded the Order of Canada in 2007 and the Queen Elizabeth's Diamond Jubilee Award in 2013. He holds an Honorary Doctor of Laws and an MBA from York University and a BA from the University of Western Ontario. Also, he received the 2001, PDAC, Developer of the Year Award.